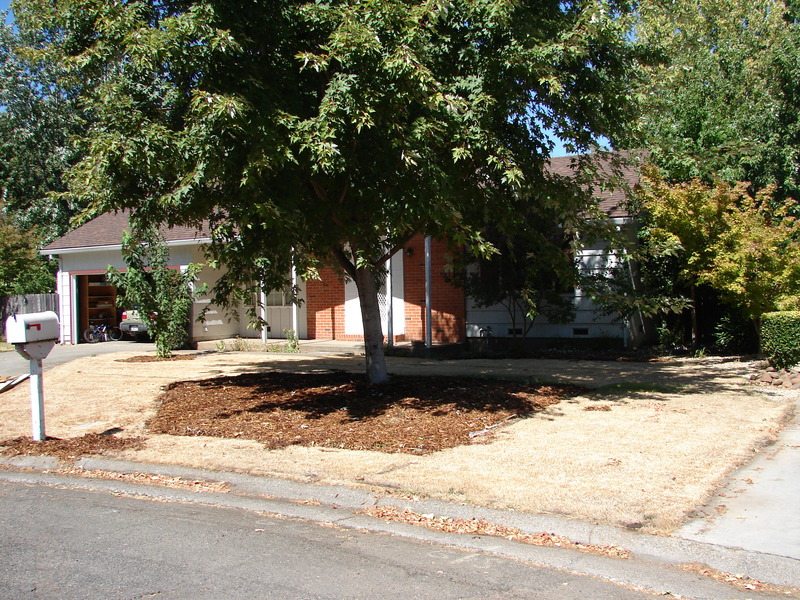 My mission to convert lawns in Chico into native and edible gardens began with a death. My kind and gentle father agreed to let me murder his front lawn. This wasn’t a limping, half-dead lawn, either. He’d been carefully mowing, fertilizing, and watering it into a state of lush greeness for the past nine years. In fact, that was the only time he ever spent in his front yard. And, being the supportive guy that he is, he not only approved of the proposed killing but acted as my accomplice. We started Solarizing in late July. Solarizing is a simple, non-toxic method for killing lawns that UC Davis has researched extensively, ceamador.ucdavis.edu/files/942.pdf . We thoroughly soaked his lawn with water (I mean, really soaked it, for hours) then rolled 4 mil clear plastic to completely cover it. We used 1×4 boards and stones that my Dad already had to securely fasten the plastic. Total time: less than 2 hours. Six weeks later, we removed the plastic. Ta da! Nothing but dead lawn except for a couple of small spots in the shadow of the large maple that grows in the center of the lawn. I used a hoe to peel these out, roots and all. We left the remains of the former lawn where they lay so they can compost into humus. We were ready to start Phase 2: planting. Here’s a step by step description of our Solarizing process. 1. Widest clear plastic sheeting you can find – least 10′ wide, clear plastic. Wider is better although more cumbersome to use. You can use one to four mil thickness plastic for solarizing. We used 4 mil thickness because we were concerned that wind might tear a thinner plastic. However, thinner plastic does allow more heat to get to the soil. Painting stores and hardware stores carry all types. It’s sold in rolls. 2. Fastening materials: Clear plastic packing tape (the strong, wide kind) to hold the plastic sheets together at the seams. 3. Fist sized stones or narrow boards to weigh the plastic down to prevent billowing. 4. Marking spray paint. This is the kind that sprays upside-down. 5. Utility knife to cut the plastic. 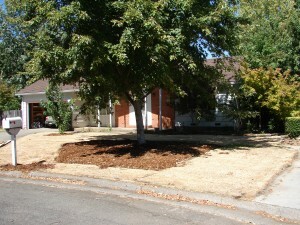 Solarizing is a non-toxic method to kills lawns and annual weeds. It works best in full sun. Use solarizing to kill fescue, rye, and bluegrass lawns. It is less successful for Bermuda grass. 1. ‘Scalp’ your lawn with mower set at lowest setting. 2. Mark the location of your irrigation heads with the spray paint. Spray the grass around the head, not the head. If your irrigation heads are hard to find, turn them on briefly so you can spot them. 3. Using a trenching machine, cultivator, or a shovel, dig a trench 4″ deep by about a foot wide around the perimeter of the area to be solarized. Bevel the inside edge of the trench so that there is not an abrupt ‘drop’ into the trench. Pile the dirt along the trench outside of the area that will be solarized. Watch out for your irrigation heads! 4. Water your lawn very thoroughly. This may take a whole day or more if you don’t have automatic sprinklers; you need to soak it deeply with about 12″ depth of water. Put several cans on your lawn to keep track of how much water you are putting down. 5. Put plastic down: Starting at one of the outside edges, roll plastic out one row at a time. Use dirt stockpiled from your trench to anchor the outside edge of plastic. At seams, overlap by 6-12″ and use a several inch long piece of tape every few feet to fasten the top layer to the bottom layer. To prevent billowing in wind, place boards or stones on the plastic. Success depends on a snug fit and tight seal! 6. Wait 4-6 weeks. It will take longer if the weather is not consistently hot (above 80 degrees) during the day or if there is shade cast onto the area. 7. Remove plastic. 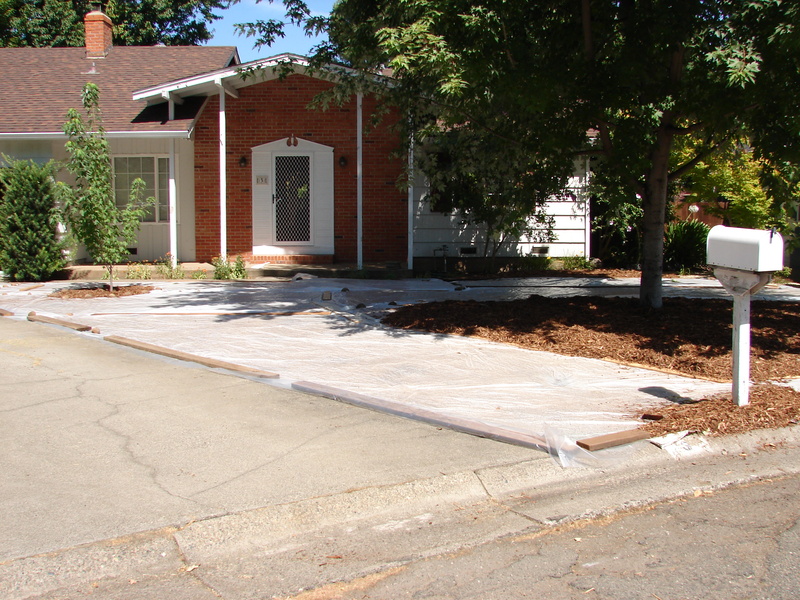 Dump trench soil onto the interior of the dead lawn so that you retain your trench. The trench will help prevent mulch (added later, after solarizing is complete and plants are in) from spilling from your planting beds. If any patches of lawn show signs of life, use a hoe to peel back and remove the sod. As for the dead lawn; just leave it in place. Eventually it will compost. 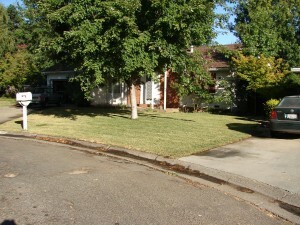 This entry was posted in New Projects and tagged chico CA garden design, eve werner landscape architect; chico CA garden design, Eve's Garden Design, front yard evolution, kill grass, kill lawn, Solarizing on September 13, 2010 by admin.